Cloakroom has a new album called Time Well that is dropping on Relapse Records tomorrow (August 18th). If you have been keeping track of the three videos they have put out leading up to the release you should already know how good it is. What you don’t know however is that as good as you think it is you still won’t have any idea of its excellence until you spin all 10 tracks. It could be said that Time Well is the definition and inspiration of all things excellent. In fact Cloakroom and their creation of Time Well is actually the catalyst to what led to the peaceful and excellent utopia that was realistically predicted in the films (documentaries) Bill & Ted’s Excellent Adventure and Bill & Ted’s Bogus Journey. In case you aren’t familiar with the utopic future the world and our human civilization has in store for I will ask you to watch this clip to get acquainted. This scene is from the future, San Dimas, California to be exact in the year 2691. The world at this time is a peaceful place and it is all because of the excellent tunes created by ‘The Great Ones’: Bill S. Preston, Esq. and Ted “Theodore” Logan. Bill & Ted as they are affectionately known cured all of society’s and the world’s issues with their positive-upbeat attitudes and righteous tunes. What future history books will tell you though is that this could not have been possible without Bill & Ted hearing Cloakroom’s Time Well and being so truly inspired by it that it became their main source material for their extremely excellent demeanor and music. 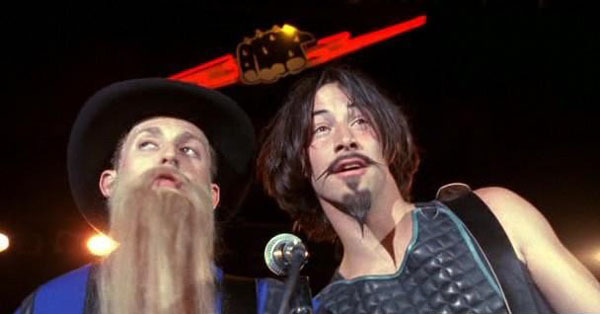 I wanted to get more information from Bill & Ted on what it is about Time Well that inspired them so much. So ‘The Great Ones’ (now old) agreed to hop in a phone booth and travel back in time for an interview. Below is a transcription of what was discussed. B.G.M. : Bill… Ted thanks so much for agreeing to the interview. B.G.M. : If you don’t mind I’d like to get right to it. Give me one word that best describes how you feel about Cloakroom’s Time Well. Let me rephrase the question. What is it exactly that makes you feel so ‘Station’ about the album? Bill: Well what makes the album so excellent is really that each song that Cloakroom has made, but especially on Time Well can make you feel a broad spectrum of emotions. Ted: Yea agreed. Like on the outside it may seem like these songs are ‘sad’ songs because of the downtune, distortion, and tempo, but when you really dig deep into them there is a complex rainbow of emotions. For example take track seven off of Time Well, “The Sun Won’t Let Us Go”. The vocals are so restrained and the tempo is so slow and yet the song has such energy. Also, the lead guitar riff that comes in at the 2:18 in my mind is absolute pure bliss. Like the kind of vibe that you get when you are chilling on some lawn in the summer time. I have to say I completely agree with both of you. Any other general observations about Time Well? Bill: Overall, I feel like Cloakroom have gotten more theatric and dynamic from Infinity, to Further Out, to now. Brian Bush’s drum intro to album opener “Gone But Not Entirely” and how the band as whole is able to ramp up the energy to another level towards the end of “Concrete Gallery” are two really good examples of the improved dynamics. Ted: Just the vibes overall are more diverse then on previous Cloakroom releases. The song I just mentioned “The Sun Won’t Let Us Go” has kind of country folky vibe to it. Where “52 Hz Whale” is more ambient and meditative in vibe. I recently read an interview where Cloakroom bassist Robert Markos talked about how the band is always trying to evolve and that this time around they started using more keyboard instruments in their music. Bill: Yea I caught that interview as well. Ted: The thing that stuck with me about that interview and the album’s press release is the complex subjects that Doyle Martin (guitar, vocals) tackles with his lyrics, but he turns these inspirations into these simple lyrics and themes that are so relatable. Really something that inspired me as we were creating our positive “Be Excellent to Each Other” rhetoric. You know as I think about it. I see a lot of what make Bill & Ted great in the personalities of the individual Cloakroom members. Have you had a chance yet to meet them? Well we met and talked to them at one of their shows and they’ve been nice enough to do interviews with the site a couple of times. They are such genuinely excellent dudes. Hey, Bill do you ever let Ted talk first? Ted: I hate my life, wait no, I mean… Let’s Rock! Last question. I feel like the epic closing song on Time Well, “The Passenger” is a direct influence on one of your greatest songs “God Gave Rock & Roll to You“. In fact I would say that this song might be a straight rip off of Cloakroom. Your response please? Bill: Maybe not a complete rip off as far as the actual notes and structure, but a direct rip off in the fact that we wrote a song that was a direct rip off how the “The Passenger” made us feel. Ted: We wanted to make a song that just screamed epic triumph and we wrote, and wrote, and wrote, and we couldn’t come up with anything. So in the end we said, “Cloakroom did it best”, so yea we blatantly ripped them off. You caught us. We owe so much to Cloakroom. I mean if you really break it down they are the ones really responsible for the positive utopia of the future. So all credit goes to them. They are the real ‘Great Ones’. Okay dudes, thanks for the time. Bill: Be Excellent to Each Other!